Published November 10, 1955, Japanese section and November 11, 1955. Three generations of Yamasaki attend the dedication of the new cafetorium at Hobart Boulevard School at a special PTA meeting, Los Angeles, California, November 8, 1955. 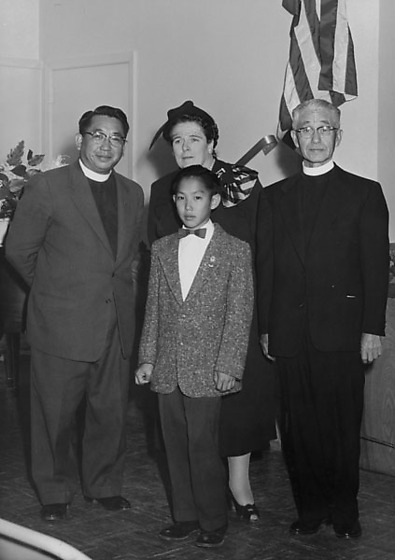 Reverend John H. Y. Yamasaki, Hobart alumnus, Eugenia O'Brian, principal, Mark Yamasaki, student body president, and Dr. John M. Yamasaki, missionary, participated in the special ceremony. Typed on original negative envelope: Hobart Ave. School -- Rev. Yamasaki and Junior.